Can Windows Phone mix it with the quad-core brigade? The mobile world has changed a lot since Nokia last put out a phone that truly wowed large amounts of people. Its tie in with Microsoft spawned some half decent handsets but despite Nokia's best efforts, the world was never truly set alight. Cue Nokia World 2012 and the announcement of the Nokia Lumia 920. Make no mistake, this is more than a big deal for both Nokia and Microsoft, with both having a lot riding on their respective contributions. Many see it as Nokia's big throw of the dice: make Windows Phone 8 into a top OS and the rewards are huge... fail, and things look ropey for the Finns. So the big question on everybody's lips is: just how does it shape up against its two current biggest rivals, the Samsung Galaxy S3 and the HTC One X? 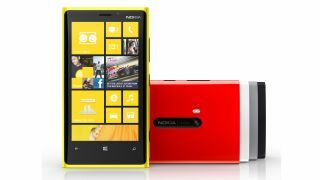 The Nokia Lumia 920 comes running Microsoft's latest version of its mobile OS, Windows Phone 8, complete with its interactive "Live Tiles" interface. Both the One X and the Galaxy S3 run Android 4 (Ice Cream Sandwich) with custom user interfaces; Touchwiz on the S3 and Sense 4.0 on the One X. Samsung has said that it plans to update the S3 to 4.1 (Jelly Bean) very soon. HTC has also promised its arrival, but has yet to name a timeframe. Nokia have opted for a dual core Snapdragon S4 chip clocked at 1.5GHz, with Nokia standing firm on its belief there's such a thing as too many cores. However, in the US all three run the same Snapdragon S4 chip - so the power is pretty even. In terms of size, all three devices are rather similar and rather large, with the Lumia 920 measuring in at 4.5 inches, the Galaxy S3 at 4.8 inches and the One X at 4.7 inches. All three look great, with the Samsung's 306ppi being pipped by the HTC's 312ppi. On the Lumia 920, Nokia have put in 'Nokia PureMotion HD+' which is supposedly better than HD in terms of screen performance. It certainly looks great, but we still can't feel we weren't as 'wowed' as we were when looking at the Super AMOLED HD of the Galaxy S3. In the Lumia 920 you'll find 32GB of on board storage, backed up by SkyDrive, Microsoft's cloud storage system. The Galaxy S3 comes with microSD support on top of Samsung's 16/32/64GB internal drive, whereas HTC decided to only go for 32GB internal storage. However, the former comes with 50GB of Dropbpox of storage, and the latter 25GB from the same source. Google users also have access to Google Drive, which is Google's answer to the cloud storage question. Nokia is playing its trump card in the camera department. Long being known for fantastic camera devices, with Carl Zeiss lenses, Nokia is bringing its PureView technology first seen on the Nokia PureView 808. However, this is placed over the top of a more modest 8MP sensor, with a 1.3MP front facing camera. It does come with a wealth of fancy features, such as being able to plug in camera apps and optical image stabilisation to help stop blur when you least want it.